When it comes to comfort, style and dynamics, the Audi Q5 and SQ5 are the new benchmark – pioneering technology, expressive styling and a powerful driving experience in one. There are no obstacles, only achievements. With the optional Audi virtual cockpit, progress is situated right in front of you. The fully digital instrument cluster with high-res 12.3-inch display depicts everything from speed to communications. The tall, slim dash top MMI display impresses with the clarity of information and ease of use. Every detail of the Q5 and SQ5 is dominated by the characteristic Q design, form perfectly following function. A sculpted hood, defined shoulder line and prominent wheel arches emphasize power and strength. They are made to move. Audi connect Navigation and Infotainment and Audi connect Security and Assistance services are available on the 2019 Q5 and SQ5. With high-speed 4G internet access available in your Audi, unlock a range of Navigation and Infotainment services that will keep you connected to your world anytime, anywhere. Available services include satellite maps, parking information, traffic light and sign information and more. To give you peace of mind on the road, with Audi connect Security and Assistance features, you are only a call or click away from help. Includes services such as stolen vehicle locator, emergency call, online roadside assistance and more. © 2019 Audi Canada. 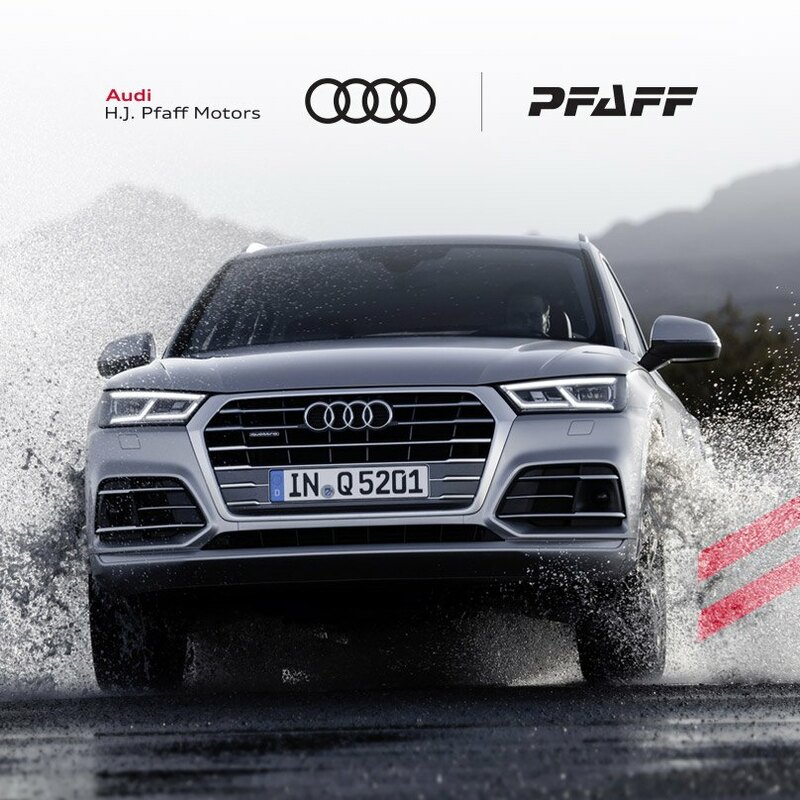 Limited-time lease and finance offers available through Audi Finance on approved credit on select new and unregistered 2019 Q5 and SQ5 models. Dealer may sell/lease for less. AUDI AG trademarks are used under license. Model shown: 2019 Audi Q5 45 TFSI quattro Technik tiptronic with base MSRP of $56,395. Offer ends April 30, 2019, and is subject to change or cancellation without notice. Dealer order/trade may be necessary. *Lease a 2019 Q5 45 TFSI quattro Komfort with a base MSRP of $47,395 (including $2,095 freight and PDI), at 2.98% for 36 months, with monthly payments of $418/month (after application of $140 Audi Credit). Air conditioning tax ($100), PPSA ($58), OMVIC ($10), tire levy ($20), dealer admin fee ($395), $5,988 down payment or equivalent trade-in, security deposit of approximately one month’s payment, and first monthly payment due at lease inception. License, insurance, registration, options, and applicable taxes are extra. The total lease obligation is $26,284 (excluding taxes). Kilometre allowance of 12,000/year; charge of $0.35/km for excess kilometres. **Finance example: Finance a 2019 Q5 45 TFSI quattro Komfort with a base MSRP of $47,495 (including $2,095 freight and PDI), at 3.98% APR for 60 months, with monthly payments of $739 per month (after application of $1,250 Audi Credit). Air conditioning tax ($100), EHF for tires ($0), PPSA ($58), OMVIC ($10), Dealer Admin Fee ($395), $5,988 down payment or equivalent trade in, due at signing. License, insurance, registration, options, and applicable taxes are extra. Cost of borrowing is $4,194 for a total obligation of $50,339. ** $1,110 Audi Credit available to be applied to reduce 2019 Q5 models lease rates by 1% from 3.9% for up to 36 months to 2.9%. Dealer participation is required. The remaining to be applied as a discount to the MSRP before taxes on purchase or lease of select 2019 Audi Q5 models. Dealer participation is required. † $1,110 Audi Credit to be applied as to reduce the 2019 Q5 lease rate and 140 to discount to the MSRP before taxes on purchase or lease of 2019 Q5 models (excludes SQ5 models). Dealer participation is required.